Well developed shoulders are the key to completing a balanced physique and getting that broad-shouldered look everyone is striving for. However, the biggest mistake people make when it comes to their shoulder workout is neglecting to focus on all three heads of the deltoid muscle. Neglecting all three heads is detrimental since proper development of all three portions is what gives them that 3 dimensional look. As you can see, it’s the balanced development of the anterior, lateral, and posterior deltoid that gives my shoulder that full look. To better understand this, let’s take a look at their anatomy. Similar to the 3 tricep heads, the deltoid muscle is divided into 3 main parts. The anterior, lateral, and posterior heads. Also commonly referred to as the front, middle, and rear delt. Note that all 3 heads will be activated to an extent during all shoulder exercises. But as made evident in the literature, each head can be emphasized through the use of specific exercises and the way you perform them. 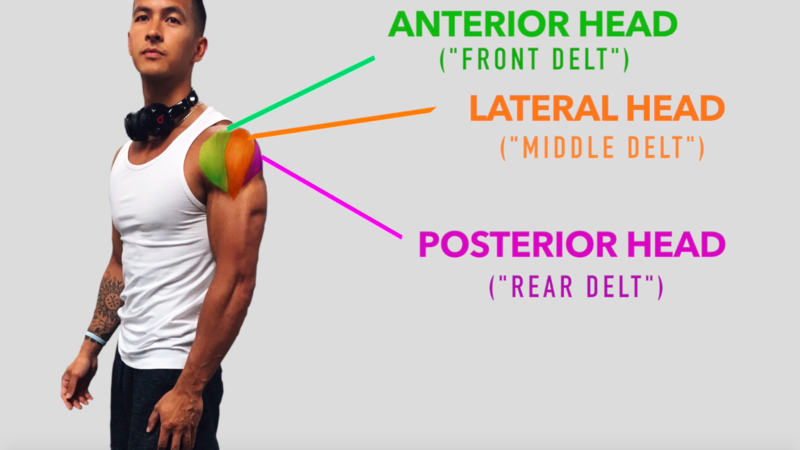 So in this article I’m going to show you a shoulder workout optimized based on current scientific literature and our anatomical understanding of the delts. But before we do so, let me briefly talk about the front delts. Is Front Delt Isolation Needed? As I previously mentioned it’s important to consider all 3 heads of the shoulders. But keep in mind that the front delt already gets sufficient indirect work through several pressing movements. This is because the anterior deltoid is already very active in exercises like the bench press. And as shown in these two studies by Trebs and Lauver, its involvement in pressing movements increases significantly as the level of incline increases. What this means is that since you’re likely performing a lot of flat and incline pressing movements involving the anterior deltoid, it’s better to focus more on the development of the lateral and posterior heads which are often more neglected in a routine. Thus, in this routine we’re going to put more emphasis on the lateral and posterior heads of the shoulder. Also keep in mind that the four rotator cuffs are important muscles that shouldn’t be neglected as they help stabilize the shoulder. But I’ll make a separate post for them. The overhead press is an essential compound movement when it comes to shoulder training. This is due to the ability to easily overload it with weight and target all deltoid heads. 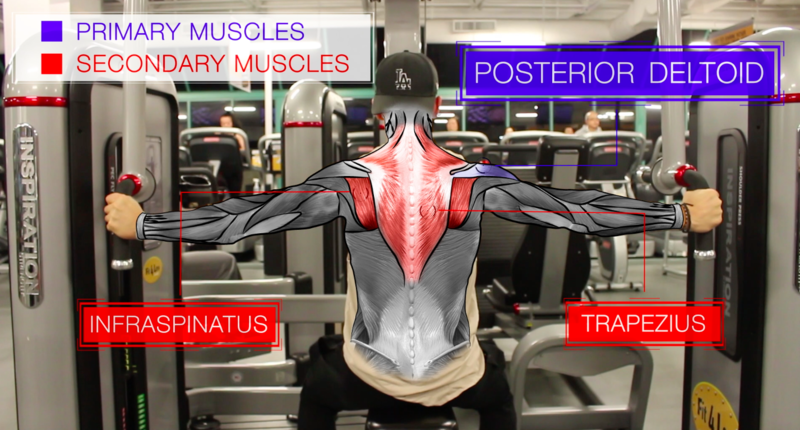 Although there are several variations of this exercise which I will discuss, they all mainly target the anterior deltoid with some involvement of the lateral and posterior heads. In addition, the standing overhead press will also put more emphasis on the core musculature and serratus anterior muscle. This exercise has been shown in studies like this one by Behren & Buskies to be the best exercise for the anterior deltoid. In fact, it was even shown to outperform dumbbell front raises by 41%. Thus I’d argue it’s the only exercise you need to include in your regimen that emphasizes the front delt. This study from the journal of strength and conditioning research compared the 4 variations. 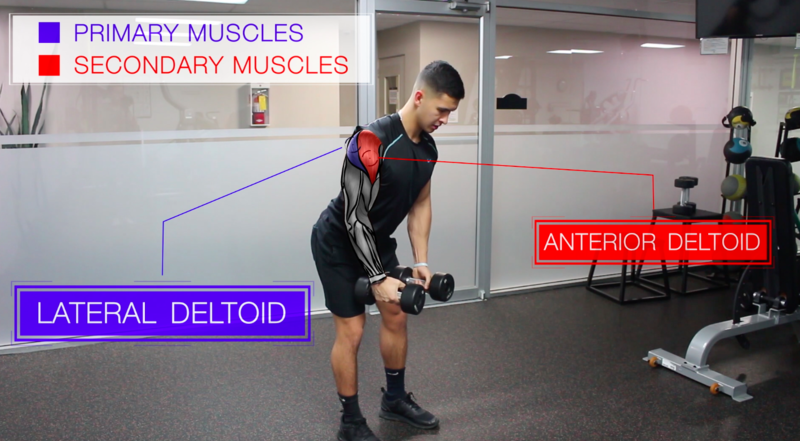 They found that the standing dumbbell press elicited higher anterior, lateral, and posterior deltoid activation than any of the other conditions. So it may seem that research suggests this variation to be best. But I think realistically it’s a difficult exercise to overload especially once you get to very heavy weight. For this reason, I’d opt for the barbell overhead press instead. 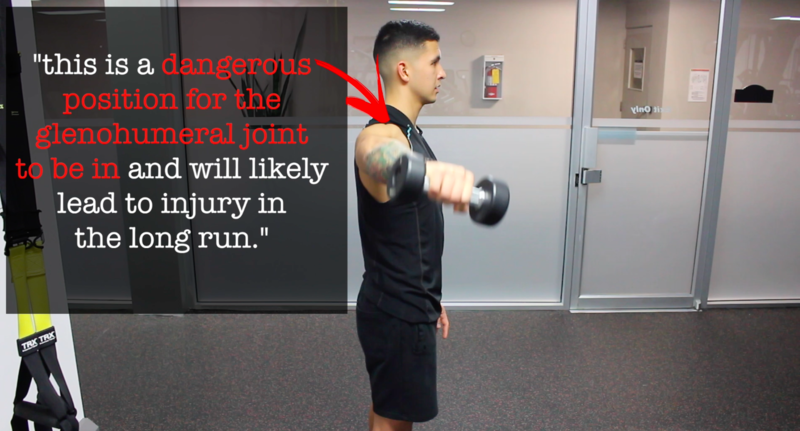 It wasn’t very far behind the standing dumbbell press in terms of overall shoulder activation and outperformed the seated variations, making it a viable alternative. But keep in mind that the other variations are still effective exercises and can be cycled through your program as needed. For example, if you plateau on the standing overhead press then feel free to switch over to the seated dumbbell press. This switch can also be made if you get bored of performing one exercise for several months. Regardless, I’d suggest sticking to one variation for an extended period of time before considering a swap. This next exercise is commonly performed in the gym and is one I highly recommend for lateral shoulder development. It’s going to target mainly the lateral deltoid with moderate involvement of the other two heads and the upper traps. 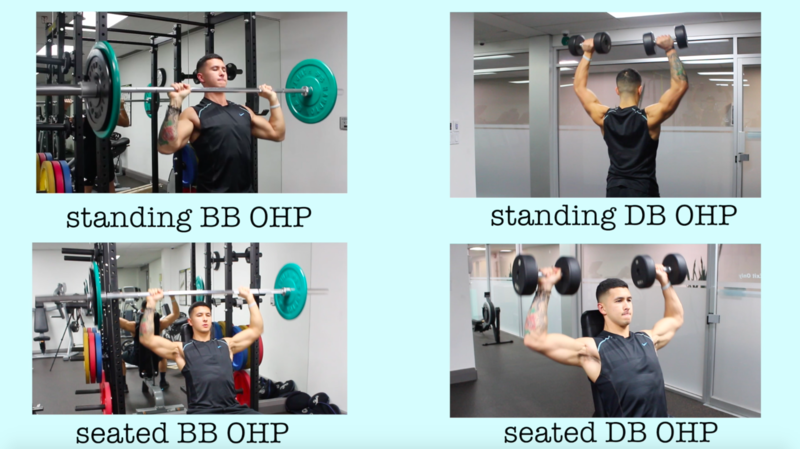 This exercise was shown in this study by Behren & Buskies to elicit the highest activation of the mid delt when compared to other common shoulder exercises. 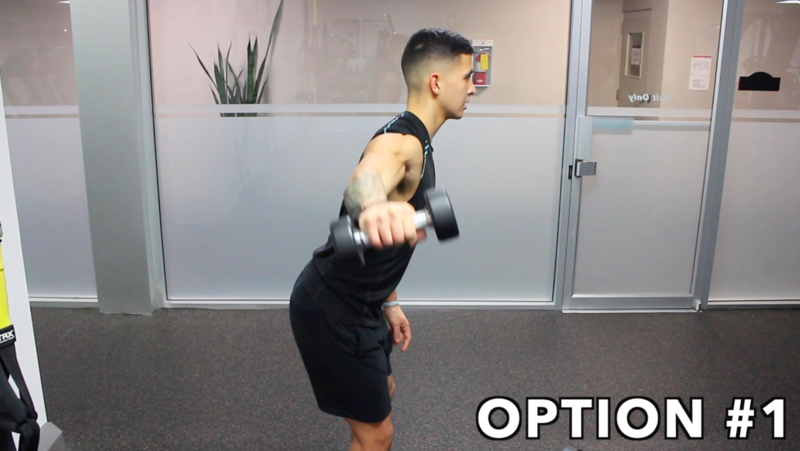 However, given that this exercise is so popular, I want to go into more depth regarding proper form and how to maximize shoulder activation while minimizing stress at the shoulder joint. 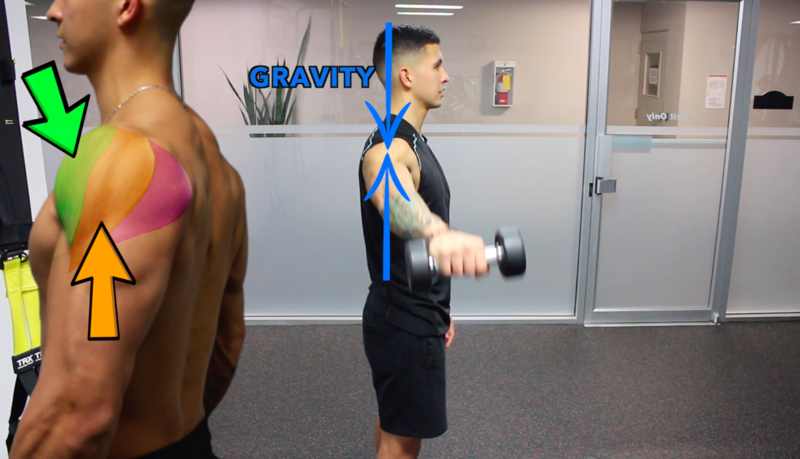 When you lift the weight to your side, the activation of each portion of the delt depends on the extent to which it’s in a direct line of force opposing gravity. So without any shoulder rotation, you can see that the lateral deltoid as well as the anterior deltoid are in a direct line of force opposing gravity. Meaning they will both be sufficiently activated. Now when we internally rotate our shoulder, think about as if you were pouring water from a pitcher, this takes the anterior deltoid out of the equation and makes the lateral deltoid in the most direct line of force which is the one we want to target. However, this is a dangerous position for the glenohumeral joint to be in and will lead to wear and tear and shoulder impingement in the long run (which can take months or even several years to happen). To fix this, what you want to do is externally rotate your shoulder when performing this exercise. But you may notice the muscle in the direct line of force now is the front delt, so to address this and put more emphasis on the mid delt, you can do one of two options. Option 1: Slightly lean forward so that the lateral deltoid is now more in the line of force. Option 2: Perform the exercise on an incline bench which is the same idea. But in both cases you want to ensure that you’re slightly externally rotating the shoulder. Now we are going to put more emphasis on the rear delts. As I mentioned earlier, their development is essential for balanced development of the shoulder and long term health. This exercise is going to mainly emphasize the posterior deltoid but will involve various other secondary muscles. Studies like this one by Pinto and colleagues have shown that the reverse pec deck elicits higher rear delt activation than the seated row and lat-pulldown. Meaning that including them in your routine is essential for optimal rear delt development. As for which handle to use on the machine, this study from the Journal of Strength and Conditioning research showed that the neutral grip, where the palms face each other, elicited higher posterior delt and infraspinatus activation than the pronated grip where the shoulders are internally rotated and the palms face down. This indicates that the neutral grip might be the better option. Why is this the case? Well, aside from horizontal abduction, the posterior deltoid also functions to externally rotate the shoulder. Since the neutral grip involves more external rotation than the pronated grip, it makes sense that it elicits higher rear delt activation. The researchers also proposed that the pronated grip position places a considerable stretch on the posterior deltoid. Thus, this position may prevent it from developing adequate force due to the length tension relationship. But, this hypotheses requires further study. However it’s important to note that there was a lot of variation in this study. Some subjects found the other grip more effective, so try out both and see which feels better for you! This exercise is my personal favorite when it comes to really isolating the rear delts and is something I highly recommend you try out. 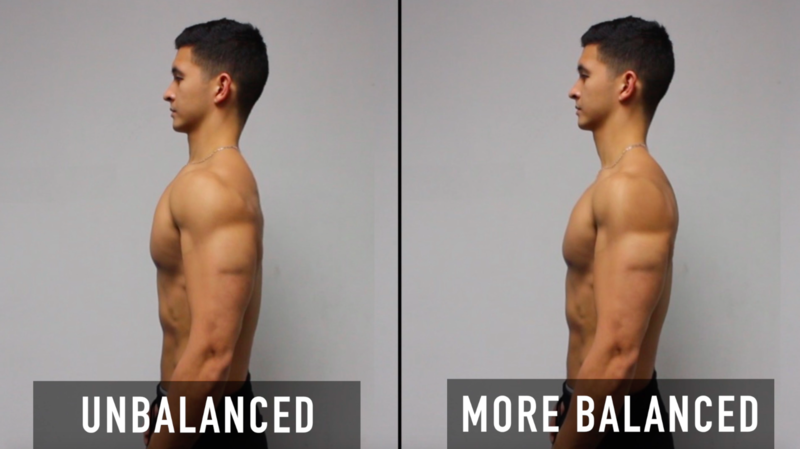 Although this variation will target similar muscles as the traditional standing face pulls will, it will lessen the involvement of the traps (more specifically the upper traps). This is because, as shown in this study from the Journal of Sports Medicine, the upper traps are more active during standing exercises since they work as a postural muscle. Thus, laying on the ground eliminates the effects of gravity and can decrease excessive activation of the upper traps. This is beneficial because most people tend to have overactive upper traps which will tend to overpower the rear delts in many movements. So by performing this exercise lying down, it enables the rear delts to be more involved by lessening the involvement of the upper traps. However, keep in mind that the traditional face pulls still have their benefits when it comes to strengthening the rotator cuffs and postural muscles. So I’d strongly advise that you still incorporate them somewhere in your routine or do a few sets of each variation. As for fiber type, the shoulders have been shown in numerous studies to be pretty much an even 50/50 split between type I and type II muscle fibers. Generally, it’s thought that high reps with low weight maximize type I fiber growth and low reps with high weight maximize type II fiber growth. Some studies agree with this. However, others show that both fiber types will grow regardless of the rep range used. But I think that research is still leaning towards including a varied rep range given their fiber type distribution. Thus, I think that both high reps and low reps in your workout would be the best option in terms of hypertrophy. So to wrap this all up, here’s a sample workout you can do using the exercises previously discussed. Feel free to swap or add exercises or split the workout in half if you’re training shoulders more than once a week. Also, here’s a link to a full 7 page PDF of the shoulder workout which you can download for free. It includes a progression scheme, exercise pictures and tips, and exercise alternatives. As well as other information you’ll find useful. Let me know if you find it useful and feel free to let me know if you have any questions regarding anything I’ve written. That’s it for this article, hope you enjoyed it. Don’t forget to give me a follow and connect with me on Instagram, Facebook, and Youtube as well. Cheers! This is absolutely phenominal. Thank you for the great work. It helps me a lot. No problem! Glad you find it useful. Great video and workout. Just wrapped up today with adding these into my shoulder workout. Loved them. Keep up the great work. Thanks! Finding you on youtube has done wonders for my workouts and development, and I’m 65 years old. One question, is it possible for you to recommend alternatives to the cable and machine sets that just use weights or suspension? I hate to have to skip an exercise in my home gym because I don’t have a pec-deck. For the pec-deck, a viable alternative would be reverse dumbbell flies. Thanks Jeremy! I’ve watches a lot of your videos, but haven’t seen a discussion on time between sets and reps, and how type I/II fibers react. Can you comment? Check out the rest periods here: https://builtwithscience.com/rest-between-sets/ – I’ll discuss type I/II fibers in a future video. Your videos are very informative. Thanks. I’ll be trying them. Thank you! And yes, I’d suggest sticking with the same exercise order. 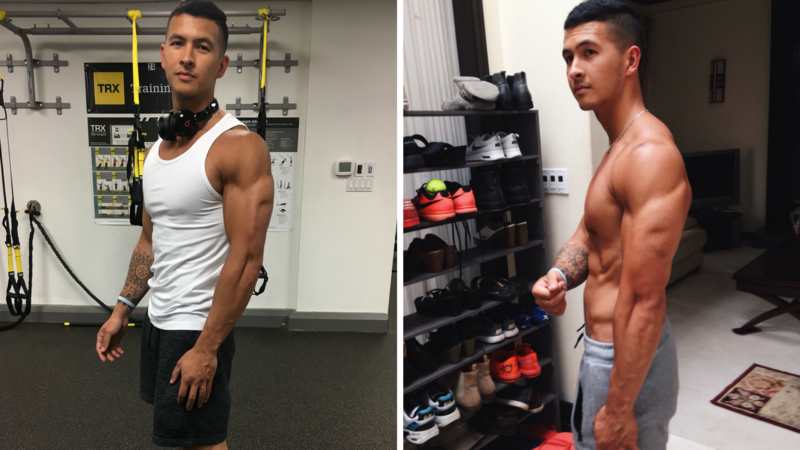 Can the lateral raise with dumbells be replaced with cable version of it? Yes – try to “lean away” as you perform them by hanging onto a pole, as it decreases the involvement of the supraspinatus and increases involvement of the lateral deltoids. Awesome article and website! Keep them coming! Exercises are detailed and thoroughly explained. You have such a great content! Really loved this article. You have demonstrated all the things properly. Can you tell me is doing Dumbbell Overhead Presses increases pressure on lumbar area lower back? Thanks! There will be more tension in the lumbar area for that exercise but it’s not necessarily a bad thing unless you experience pain/discomfort, in which an alternative overhead exercise would be ideal. Would reverse fly with external rotation be an effective side delt exercise for hypertrophy? Can it be used as the primary side delt exercise? Are you referring to the machine reverse fly? Yes. But with external rotation (thumbs up grip). What is your opinion on shoulder shurgs? 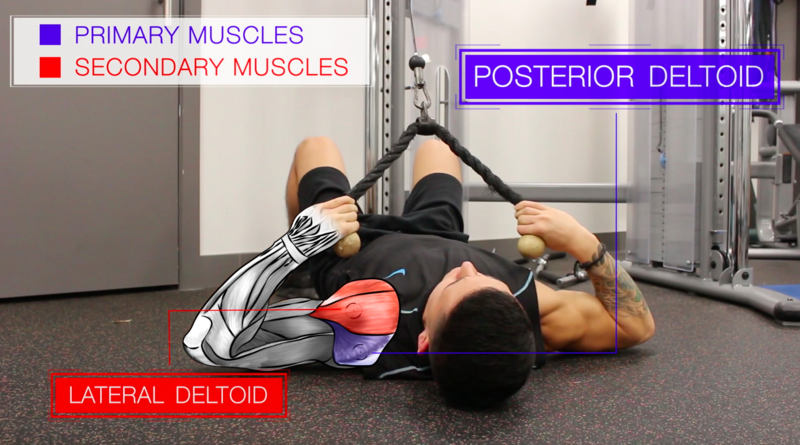 Good movement for the upper traps – will talk more about them in my upcoming traps video. Do push ups (e.g. 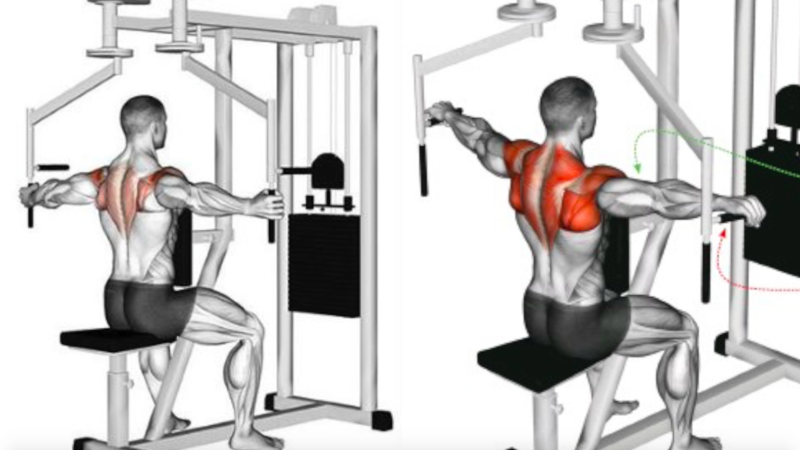 40/day) sufficiently work the front and rear head of the deltoids (not for huge mass building) or do I need to do other isolation exercises for these? The front delt yes but not the rear delt.